Except perhaps for some remote island dwellers, most people have a natural tendency to view continents as fundamental, permanent and even characteristic features of Earth. One easily forgets that the worlds continental platforms amount only to scattered and isolated masses on a planet that is largely covered by water. But when viewed from space, the correct picture of Earth becomes immediately clear. It is a blue planet. From this perspective it seems quite extraordinary that over its long history Earth could manage to hold a small fraction of its surface always above the sea--enabling, among other things, human evolution to proceed on dry land. Is the persistence of high-standing continents just fortuitous? How did Earths complicated crust come into existence? Has it been there all the time, like some primeval icing on a planetary cake, or has it evolved through the ages? Such questions had engendered debates that divided scientists for many decades, but the fascinating story of how the terrestrial surface came to take its present form is now essentially resolved. That understanding shows, remarkably enough, that the conditions required to form the continents of Earth may be unmatched in the rest of the solar system. Earth and Venus, being roughly the same size and distance from the sun, are often regarded as twin planets. So it is natural to wonder how the crust of Venus compares with that of our own world. Although centuries of telescopic observations from Earth could give no insight, beginning in 1990 the Magellan space probes orbiting radar penetrated the thick clouds that enshroud Venus and revealed its surface with stunning clarity. From the detailed images of landforms, planetary scientists can surmise the type of rock that covers Venus. Our sister planet appears to be blanketed by rock of basaltic composition--much like the dark, fine-grained rocks that line the ocean basins on Earth. Magellans mapping, however, failed to find extensive areas analogous to Earths continental crust. Elevated regions named Aphrodite Terra and Ishtar Terra appear to be remnants of crumpled basaltic lavas. Smaller, dome-shaped mounds are found on Venus, and these forms might indicate that volcanic rocks with the composition of granite do exist in some places, but radar reflections show that these pancakelike features may be composed merely of more basalt. After analyzing the wealth of radar data provided by Magellan, scientists have concluded that plate tectonics (that is, the continual creation, motion and destruction of parts of the planet's surface) does not seem to operate on Venus. There are no obvious equivalents to the extensive mid-ocean ridges or to the great trench systems of Earth. Thus, it is unlikely that the crust of Venus regularly recycles back into that planet's mantle. Nor would there seem to be much need to make room for new crust: the amount of lava currently erupting on Venus is roughly equivalent to the output of one Hawaiian volcano, Kilauea--a mere dribble for the planet as a whole. These findings from Venus and similar surveys of other solid bodies in the solar system show that planetary crusts can be conveniently divided into three fundamental types. So-called primary crusts date back to the beginnings of the solar system. They emerged after large chunks of primordial material came crashing into a growing planet, releasing enough energy to cause the original protoplanet to melt. As the molten rock began to cool, crystals of some types of minerals solidified relatively early and could separate from the body of magma. This process, for example, probably created the white highlands of the moon after low-density grains of the mineral feldspar floated to the top of an early lunar "ocean" of molten basalt. The crusts of many satellites of the giant outer planets, composed of mixtures of rock with water, methane and ammonia ices, may also have arisen from catastrophic melting during initial accretion. In contrast to the product of such sudden, large-scale episodes of melting, secondary crusts form after heat from the decay of radioactive elements gradually accumulates within a planetary body. Such slow heating causes a small fraction of the planets rocky mantle to melt and usually results in the eruption of basaltic lavas. The surfaces of Mars and Venus and Earth's ocean floors are covered by secondary crusts created in this way. The lunar maria (the "seas" of the ancient astronomers) also formed from basaltic lavas that originated deep in the moons interior. Heat from radioactivity--or perhaps from the flexing induced by tidal forces--on some icy moon's of the outer solar system may, too, have generated secondary crusts. Unlike these comparatively common types, so-called tertiary crust may form if surface layers are returned back into the mantle of a geologically active planet. Like a form of continuous distillation, volcanism can then lead to the production of highly differentiated magma of a composition that is distinct from basalt--closer to that of the light-colored igneous rock granite. Because the recycling necessary to generate granitic magmas can occur only on a planet where plate tectonics operates, such a composition is rare in the solar system. The formation of continental crust on Earth may be its sole location. Despite the small number of examples within each category, one generalization about the genesis of planetary surfaces seems easy to make: there are clear differences in the rates at which primary, secondary and tertiary crusts form. The moon, for instance, generated its white, feldspar-rich primary crust--about 9 percent of lunar volume--in only a few million years. Secondary crusts evolve much more slowly. The moons basalt maria (secondary crust) are just a few hundred meters thick and make up a mere one tenth of 1 percent of the moons volume, and yet these so-called seas required more than a billion years to form. Another example of secondary crust, the basaltic oceanic basins of our planet (which constitute about one tenth of 1 percent of Earths mass), formed over a period of about 200 million years. Slow as these rates are, the creation of tertiary crust is even less efficient. Earth has taken several billion years to produce its tertiary crust--the continents. These features amount to just about one half of 1 percent of the mass of the planet. MANY ELEMENTS that are otherwise rarely found on Earth are enriched in granitic rocks, and this phenomenon gives the continental crust an importance out of proportion to its tiny mass. But geologists have not been able to estimate the overall composition of crust--a necessary starting point for any investigation of its origin and evolution--by direct observation. One conceivable method might be to compile existing descriptions of rocks that outcrop at the surface. Even this large body of information might well prove insufficient. A large-scale exploration program that could reach deeply enough into the crust for a meaningful sample would press the limits of modern drilling technology and would, in any event, be prohibitively expensive. Fortunately, a simpler solution is at hand. Nature has already accomplished a widespread sampling through the erosion and deposition of sediments. Lowly muds, now turned into solid sedimentary rock, give a surprisingly good average composition for the exposed continental crust. These samples are, however, missing those elements that are soluble in water, such as sodium and calcium. Among the insoluble materials that are transferred from the crust into sediments without distortion in their relative abundances are the 14 rare-earth elements, known to geochemists as REEs. These elemental tags are uniquely useful in deciphering crustal composition because their atoms do not fit neatly into the crystal structure of most common minerals. They tend instead to be concentrated in the late-forming granitic products of a cooling magma that make up most of the continental crust. Because the REE patterns found in a variety of sediments are so similar, geochemists surmise that weathering, erosion and sedimentation must mix different igneous source rocks efficiently enough to create an overall sample of the continental crust. All the members of the REE group establish a signature of upper crustal composition and preserve, in the shapes of the elemental abundance patterns, a record of the igneous events that may have influenced the makeup of the crust. Using these geochemical tracers, geologists have, for example, determined that the composition of the upper part of the continental crust approximates that of granodiorite, an ordinary igneous rock that consists largely of light-colored quartz and feldspar, along with a peppering of various dark minerals. Deep within the continental crust, below about 10 to 15 kilometers, rock of a more basaltic composition is probably common. The exact nature of this material remains controversial, and geologists are currently testing their ideas using measurements of the heat produced within the crust by the important radioactive elements uranium, thorium and 40K, the radioactive isotope of potassium. But it seems reasonable that at least parts of this inaccessible and enigmatic region may consist of basalt trapped and underplated beneath the lower-density continents. It is this physical property of granitic rock--low density--that explains why most of the continents are not submerged. Continental crust rises on average 125 meters above sea level, and some 15 percent of the continental area extends over two kilometers in elevation. These great heights contrast markedly with the depths of ocean floors, which average about four kilometers below sea level--a direct consequence of their being lined by dense oceanic crust composed mostly of basalt and a thin veneer of sediment. At the base of the crust lies the so-called Mohorovicic discontinuity (a tongue-twisting name geologists invariably shorten to "Moho"). This deep surface marks a radical change in composition to an extremely dense rock rich in the mineral olivine that everywhere underlies both oceans and continents. Geophysical studies using seismic waves have traced the Moho worldwide. Such research has also indicated that the mantle below the continents may be permanently attached at the top. These relatively cool subcrustal "keels" can be as much as 400 kilometers thick and appear to ride with the continents during their plate-tectonic wanderings. Support for this notion comes from the analysis of tiny mineral inclusions found within diamonds, which are thought to originate deep in this subcrustal region. Measurements show that diamonds can be up to three billion years old and thus demonstrate the antiquity of the deep continental roots. It is curious to reflect that less than 50 years ago, there was no evidence that the rocks lining ocean basins differed in any fundamental way from those found on land. The oceans were simply thought to be floored with foundered or sunken continents. This perception grew naturally enough from the concept that the continental crust was a world-encircling feature that had arisen as a kind of scum on an initially molten planet. Although it now appears certain that Earth did in fact melt very early, it seems that a primary granitic crust, of the type presumed decades ago, never actually existed. HOW WAS IT that two such distinct kinds of crust, continental and oceanic, managed to arise on Earth? To answer this question, one needs to consider the earliest history of the solar system. In the region of the primordial solar nebula occupied by Earths orbit, gas was mostly swept away, and only rocky debris large enough to survive intense early solar activity accumulated. These objects themselves must have grown by accretion, before finally falling together to form our planet, a process that required about 50 million to 100 million years. Late in this stage of formation, a massive planetesimal, perhaps one the size of Mars, crashed into the nearly fully formed Earth. The rocky mantle of the impactor was ejected into orbit and became the moon while the metallic core of the body fell into Earth. As might be expected, this event proved catastrophic: it totally melted the newly formed planet. As Earth later cooled and solidified, an early basaltic crust probably formed. It is likely that at this stage the surface of Earth resembled the current appearance of Venus; however, none of this primary crust has survived. Whether it sank into the mantle in a manner similar to that taking place on Earth or piled up in localized masses until it was thick enough to transform into a denser rock and sink remains uncertain. In any event, there is no evidence of substantial granitic crust at this early stage. Telltale evidence of such a crust should have survived in the form of scattered grains of the mineral zircon, which forms within granite and is very resistant to erosion. Although a few ancient zircons dating from near this time have been found (the oldest examples are from sedimentary rocks in Australia and are about 4.3 billion years old), these grains are exceedingly scarce. More information about the early crust comes from the most ancient rocks to have survived intact. These rocks formed deep within the crust just less than four billion years ago and now outcrop at the surface in northwest Canada. This rock formation is called the Acasta Gneiss. Slightly younger examples of early crust have been documented at several locations throughout the world, although the best studied of these ancient formations is in western Greenland. The abundance of sedimentary rock there attests to the presence of running water and to the existence of what were probably true oceans during this remote epoch. But even these extraordinarily old rocks from Canada and Greenland date from some 400 million to 500 million years after the initial accretion of Earth, a gap in the geologic record caused, no doubt, by massive impacts that severely disrupted Earths earliest crust. From the record preserved in sedimentary rocks, geologists know that the formation of continental crust has been an ongoing process throughout Earths long history. But the creation of crust has not always had the same character. For example, at the boundary between the Archean and Proterozoic eons, around 2.5 billion years ago, a distinct change in the rock record occurs. The composition of the upper crust before this break contained less evolved constituents, composed of a mixture of basalt and sodium-rich granites. These rocks make up the so-called tonalite-trondjemite-granodiorite, or TTG, suite. This composition differs considerably from the present upper crust, which is dominated by potassium-rich granites. The profound change in crustal composition 2.5 billion years ago appears to be linked to changes in Earths tectonic regime. Before this time, higher levels of radioactive decay produced more heat in the planet. The consequence was that in the earlier Archean the oceanic crust was hotter, thicker and more buoyant and was not able to be subducted. Instead, under thicker sections of crust that may resemble modern Iceland, denser crust melted and produced the sodium-rich igneous rocks of the TTG suite. Somewhat similar rocks now form in a few places such as southern Chile, where young oceanic crust subducts. But these modern rocks, forming now because of plate tectonics, are subtly different from their older Archean cousins, which formed from sinking slabs under thick crust. Modern-style plate tectonics did not begin operating until the late Archean (between 3.0 billion and 2.5 billion years ago), when the oceanic crust became cooler, lost its buoyancy and was thus able to sink back into the mantle. The early tendency for magma to form with a TTG composition explains why crust grew as a mixture of basalt and tonalite during the Archean eon. Large amounts--at least 50 percent and perhaps as much as 70 percent of the continental crust--emerged at this time, with a major episode of growth between 3.0 billion and 2.5 billion years ago. Since that time, the relative height of ocean basins and continental platforms has remained comparatively stable. With the onset of the Proterozoic eon 2.5 billion years ago, the crust had already assumed much of its present makeup, and modern plate-tectonic cycling began. Currently oceanic crust forms by the eruption of basaltic lava along a globe-encircling network of mid-ocean ridges. More than 18 cubic kilometers of rock are produced every year by this process. The slab of newly formed crust rides on top of an outer layer of the mantle, which together make up the rigid lithosphere. The oceanic lithosphere sinks back into the mantle at so-called subduction zones, which leave conspicuous scars on the ocean floor in the form of deep trenches. At these sites the descending slab of lithosphere carries wet marine sediments as well as basalt plunging into the mantle. At a depth of about 80 kilometers, heat drives water and other volatile components from the subducted sediments into the overlying mantle. These substances then act as a flux does at a foundry, inducing melting in the surrounding material at reduced temperatures. The magma fractionates, producing andesites, while the more basic substratum probably sinks back into the mantle in a process called delamination. The andesite magma produced in this fashion eventually reaches the surface, where it causes spectacular, explosive eruptions. The 1980 eruption of Mount St. Helens is an example of such a geologic cataclysm. Great chains of volcanoes--such as the Andes--powered by boiling volatiles add on average about two cubic kilometers of lava and ash to the continents every year. This andesite provides the bulk material of the continents. But the more silica-rich granitic rock, which we see at the surface of the continents, comes from within the crust. The accumulation of heat deep within the continental crust itself can cause melting, and the resultant magma will ultimately migrate to the surface. Although some of this necessary heat might come from the decay of radioactive elements, a more likely source is basaltic magma that rises from deeper in the mantle and becomes trapped under the granitic lid; the molten rock then acts like a burner under a frying pan. ALTHOUGH THE MOST DRAMATIC SHIFT in the generation of continental crust happened at the end of the Archean eon, 2.5 billion years ago, the continents appear to have experienced episodic changes throughout all of geologic time. For example, sizable, later additions to the continental crust occurred from 2.0 to 1.7, from 1.3 to 1.1 and from 0.5 to 0.3 billion years ago. That Earth's continents experienced such a punctuated evolution might appear at first to be counterintuitive. Why, after all, should crust form in spurts if the generation of internal heat--and its liberation through crustal recycling--is a continuous process? A more detailed understanding of plate tectonics helps to solve this puzzle. During the Permian period (about 250 million years ago), the major continents of Earth converged to create one enormous landmass called Pangaea [see "Earth before Pangaea," on page 14]. This configuration was not unique. The formation of such "supercontinents" appears to recur at intervals of about 600 million years. 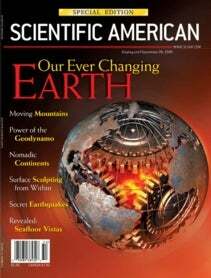 Major tectonic cycles driving the continents apart and together have been documented as far back as the Early Proterozoic, and there are even suggestions that the first supercontinent may have formed earlier, during the Archean. Such large-scale tectonic cycles serve to modulate the tempo of crustal growth. When a supercontinent breaks itself apart, oceanic crust is at its oldest and hence most likely to form new continental crust after it subducts. As the individual continents reconverge, volcanic arcs (curved chains of volcanoes created near subduction zones) collide with continental platforms. Such episodes preserve new crust as the arc rocks are added to the margins of the continents. For more than four billion years, the peripatetic continents have assembled themselves in fits and starts from many disparate terranes. Buried in the resulting amalgam is the last remaining testament available for the bulk of Earths history. That story, assembled from rocks that are like so many jumbled pieces of a puzzle, has taken some time to sort out. But the understanding of crustal origin and evolution is now sufficient to show that of all the planets Earth appears truly exceptional. By a fortunate accident of nature--the ability to maintain plate-tectonic activity--one planet alone has been able to generate the sizable patches of stable continental crust that we find so convenient to live on. S. ROSS TAYLOR and SCOTT M. MCLENNAN have worked together since 1977 examining Earths crustal evolution. Taylor has also actively pursued lunar and planetary studies and has published many books on planetology. He is a foreign associate of the National Academy of Sciences. Taylor is currently with the department of earth and marine sciences at the Australian National University and the Lunar and Planetary Institute in Houston. McLennan is professor in the department of geosciences at Stony Brook University. His research applies the geochemistry of sedimentary rocks to studies of crustal evolution on Earth and Mars. McLennan is a member of the Mars Exploration Rover science team.